Divi doesn’t use the default excerpts, but instead just truncates the beginning of the post and shows the first 270 characters. That means Relevanssi-generated excerpts don’t show up at all. In order to fix this, you need to change the excerpts to use the_excerpt(); instead of truncate_post( 270 );. ElegantThemes has good instructions on how to do that. Just follow these instructions, but where they tell you to enter truncate_post( 470 );, put in the_excerpt(); instead. Update 27.4.2018: This is no longer necessary with Divi and Visual Composer, Relevanssi handles these automatically now. If you’re using the page builder in Divi, it’ll work with Relevanssi, but the excerpts may look ugly because of the shortcodes the page builder uses to format the pages. The solution is, however, easy: just remove the Divi shortcodes before the excerpt is built. The following code is placed in the theme functions.php and will remove all shortcodes that start with [et_pb before the excerpts are built. The code doesn’t affect the normal shortcode functionality, only the Relevanssi excerpts. This is great – could you please explain where this code is to be placed?? 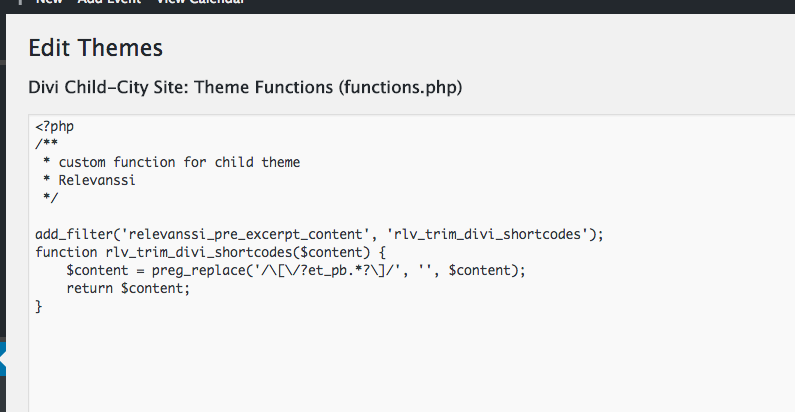 Theme functions.php is a good place. Newbie question…. Where should this code be put on Divi ? I am using the7 theme and get the same results. I added the code to my functions.php and reindexed. I still get the ugly descriptions, ideas? Is the7 using the [et_pb] shortcodes, or something with a different name? It’s the visual composer layout short codes. And you renamed et_pb in that code to vc, and it still doesn’t work? That was the issue, thank you! An if there is more than one code to strip? is the same code? Depends on how and where in the process the plugin adds the text. If it happens after Relevanssi is done, then it’s impossible to block from Relevanssi, if it happens before then it’s simple, just use relevanssi_excerpt_content filter to weed it out. And yes, you can add multiple preg_replace() lines to clean out multiple tags. Thanks I found the problem there was a setting related to categories now is working fine. The problem of this solution is that all excerpts related to divi (such as title or text) will be ignore in the search results. Is there better solution for this problem? like, interpreting all of divi codes before considering theme as excerpt? This solution doesn’t actually affect the search results, only the excerpts. Relevanssi expands all the shortcodes when preparing the content for excerpts, but the Divi shortcodes do not work properly and cannot be expanded at that point. Thanks a lot for your quick reply. I know the results will remain the same, but the excerpt that will be show with the results may not be related to the search keyboard(s). For example if I search a title of divi text the excerpt will be unrelated to that because we ignore theme. All in all is there any better solution to keep the context of divi modules in the excerpts? No, not that I know of. My recommendation is to steer clear of these visual composer themes, all I see from them is trouble anyway. Are you sure those search results are generated by Relevanssi? I assume so, I had Relevanssi installed & activated. Also, ensured the settings were set to not include shortcodes. Relevanssi expands all shortcodes before building the excerpt, except the ones it cannot (for example the page builder shortcodes). Theme shortcodes need to be removed with the filter, as explained in the posts. WordPress shortcodes, like [caption], should be removed automatically. You’ve enabled the custom excerpts in Relevanssi settings? Adjusting Relevanssi excerpt settings changes the excerpts, for example if you adjust the length of the excerpt in the settings, it changes on the results page? Wow, no shortcodes were removed when i used your patch. Yes, custom excerpts were enabled, yes it changed on the results page. Have you checked that the filter code is running in the first place? and then do a search. If the filter is running, you should see the text “running filter” and nothing else. Thank you. The filter code is not running. Could this be caused by caching? Maybe. That, or a typo in the code somewhere. Is the filter code in theme functions.php so that it gets noticed by WordPress? Somehow WP and Relevanssi are just not seeing the code. I fixed it. Now it says running filter only on a white screen. Ok, now remove the code you added and enjoy excerpts without Visual Composer codes, hopefully. http://poochcoach.com/?s=trainer is an example. Very first item in list has shortcode before all else. Yeah, looks like so. If the code doesn’t help, I can’t help you much more, at least without a closer look at your site – and that’s something I can’t do here for free. If i buy a Pro License, will you? What do i need to do to get you to look closer? Sure, this is something that comes with the support license. I could confirm the filter is running using echo “running filter”; exit(); and then removing it again. I did check the boxes on “new user defined search sniplet” and “execute shortcodes in results” in the relevanssi settings. Is there anything else I could try to solve this issue? That should clean it up a bit. This is ist! Works great now! Thanks a lot, amazing! One last question though, before when doing a search and clicking on one of the results of the results page I am redirected to the site of the result and all search terms on that site are highlighted. In addition to that I had little stripe marks on the page scroll bar on the right side of the screen indicating the position where the searchterms are positioned on the page. These handy stripemarks are gone now. Is this a sideffect of the code I implemented or is there another setting I can change to get them back? also there are still some search results that show MK_ codes like “[mk_step font_size=“25″… ” but much less. The code should clean all of those, so hard to say what’s up with that. Relevanssi has nothing to do with the stripe marks. It hasn’t created them, and I can’t see how it could have removed them. So no idea about them. True, i found out its a handy feature of google chrome. Thank you for your support and plugin. 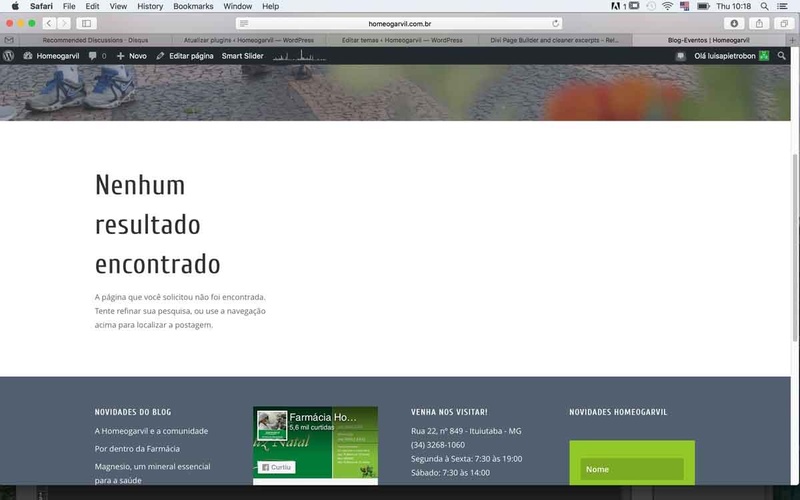 I am using Jupiter Theme from Artbees, and visual Composer. What should I write instead of Divi? What kind of shortcodes are you seeing? If you’re seeing [vc_] and [mk_] shortcodes, then that is correct, except you need to remove the first “return $content;”. Where does this code go for Divi sites? Are those excerpts generated by Relevanssi in the first place? If they are, that code should fix it, but if they’re not, then it doesn’t work. If you change the excerpt length settings from Relevanssi settings page, do the excerpts change? Okay, first of all. Newbie-ish person here. I glanced through the manual, but did not find anything on what an excerpt actually was. I thought it was a query result. This mostly sounds above my head. ha! It has the same meaning as in regular English, ie. a snippet of text. That is, the part of the post that is shown on the search results page. See the excerpt settings in Relevanssi settings page. If you change the excerpt length in the settings, do the search results pages change? nope. does not look like this is working for me. I changed it to 10 words and still get this whole long thing like the wordpress search. Ok, that’s why the Relevanssi filter is not working: you’re not seeing Relevanssi-generated excerpts. If you have enabled custom excerpts in Relevanssi settings, the next step is to adjust your theme. That may be easy – there may be a setting in your theme settings that lets you adjust what is shown on the search results pages, ie. do you see whole posts or just excerpts – or difficult, as in requiring changes to your theme templates. As far as I can tell, Relevanssi and Divi should work fine. Is Relevanssi powering the search in the first place? If you disable Relevanssi, do the results change? nope. not running at all. Results are the same old wordpress search stuff. You may want to try disabling other plugins to see if there’s a conflict with Relevanssi; or try switching temporarily to one of the default themes to see if the problem is with the theme, though Divi should work with Relevanssi. Hello! It totally worked for my excerpts! Thank you very much! Another problem I am getting since I installed relevansii, is that the “no result” page from the search has the text all separated in three rows, like in the print screen. All the other pages where I get a “no result” (category pages with no posts for example), are looking normal. Like in the second print screen. I use the last version of DIVI theme of elegantthemes.com. I tried to use your plugin but seems not works fine. 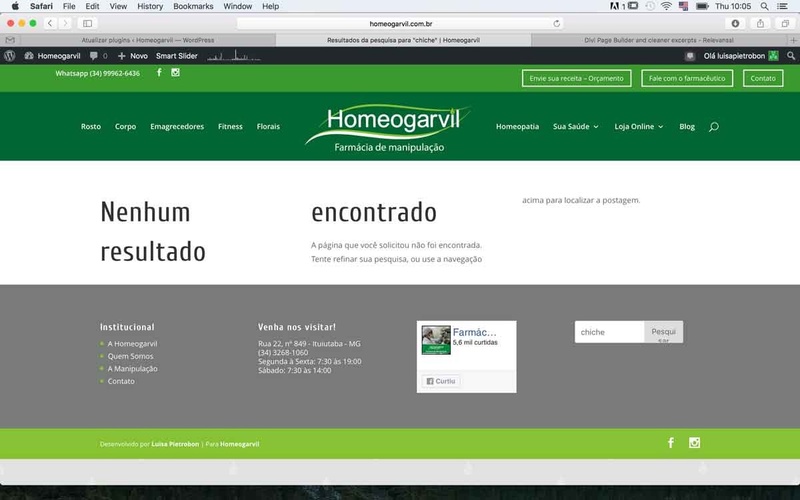 http://www.domain.com/?s=personale and the search works fine! and the result is blank! I have created a functions.php file in /child theme folder but nothing. Can you use a different search form that would not add the unnecessary parameters? Perhaps the default WordPress search widget? Or you can create a pre_get_posts filter function that strips the unnecessary parameters off. Perhaps you can hire someone who’s experienced in Divi or ask Divi support to help you? I used this method and it works.. but i also use [stm_post_info] in my post its theme component. I developed a plugin to Easily Remove Unused, Broken Shortcodes from any theme (Divi, Avada, ..etc) or a plugin. which it removes unused, broken shortcodes from WordPress, so you can switch between themes and plugins without worrying and keep your content cleanly and fresh all the time, it is dealing with any theme (Divi, Avada, ..etc) shortcodes that are left when changing themes or plugins. I think it will be useful for any site.